Tourism is constantly changing, it not remains firm and unchanging always. This also happens in China. Travelers now are no longer satisfied to visit only local tourist attractions, but want to know the people, the culture, the traditions of China. Living in a Chinese family: this is the favorite expectation especially by most clever foreign tourists, those who want to know the human reality that they can get under the tourism facade. We've found someone, if you want contribute by indicate one or more, use the space below. There is a kind of hospitality that crosses borders and is preferred by millions of tourists. It is a simpler form of hotel, small size (usually within the 10 rooms) and generally run by family. We talk about the Bed and Breakfast. Very often this type of structure is preferred by travelers from United States, Britain, Germany, Australia, Canada, France, Italy, Spain. We have found for you the best ones BnB in China. The Bed and Breakfast in China very soon will become an extraordinary resource for Chinese tourism. This is mainly for three reasons: 1) Within three years there will be a new big boom of tourists to China and the hotels, although very numerous, will not be sufficient to accommodate all. 2) The B & B in China are very numerous, and now they are preparing to enter the market with a leap of quality; 3) The Bed and Breakfast is a kind of reception very popular with Western tourists, especially for those who come from Europe, America, Australia. A Bed and Breakfast to be very popular must have three main features. First of all must be open to dialogue with the tourist, prodigal of information, collaborative and have friendly attitude towards guests. The B & B must also to be an expression of the local culture. So characteristic elements must be present in the breakfast, furnishings, decorations, and also in the exposition of photos and handicrafts. Possibly expose brochures to visit the local attractions. Finally, the B & B should have low, accessible fares. But if the BB has some very special feature (for example is located within a Hutong), it is obvious and acceptable that prices are higher. 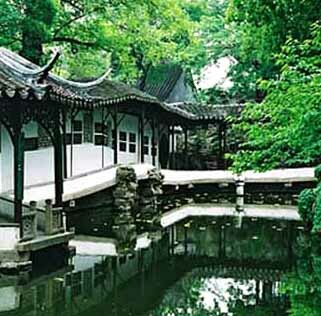 There are B & B even within traditional houses of ancient China. For example, the Beijing Hutong. The Hutong are formed by thousands of dwellings (Siheyuan) intertwined, that once surrounded the Forbidden City of Beijing. Siheyuans are courtyards with buildings on all four sides. Other types of traditional Chinese architecture can be found in Yunnan (Yin Yi ke). 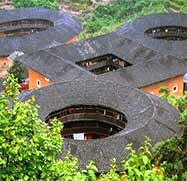 In Fujian there are the famous circular houses called Hakka Houses or Tulou. Travelers who prefer to spend the night in simple structures, small (under 10 rooms), well located, very clean, inexpensive, with a warm human, are millions and millions around the world. These characteristics are of a different type of structure from the hotel whose international name is, precisely, Bed and breakfast. The nations that intend be at the forefront in welcoming international tourism, must necessarily develop internally also a system of Bed and Breakfast that can satisfy this market's section. In China similar structures for now are recognizable in Family hotels, in the Inn, or Guesthouse, or in personalized names where appears the word House, or Home, or Family. But there are also hundreds of thousands of families that are willing to come into play and become truly Bed and Breakfast. Some of them are already able to accommodate foreigners. For the other, not yet able to provide a host of quality, there 'to work a little' problem on language (in every BB should be someone who speaks English) and on organizational readiness. But certainly a great multitude of Chinese Bed and Brekfast will be able to do its part in the great tourism development expected in the coming years. 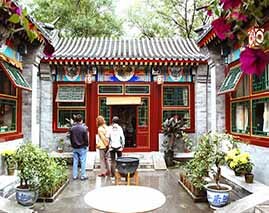 Built in the first part of the Qing dinasty, this is a true Imperial Hutong, with its beautiful courtyards and corridors. 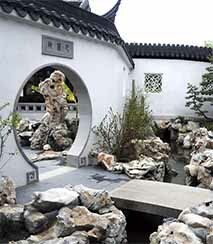 Here dwelt even Mei Lanfang, a famous master of Chinese Opera. Near Wangfujin Street, the Forbidden City and Tiananmen Square. How are the guests of the B & B. The Bed and Breakfast is also a cultural phenomenon. The customers are usually educated, well-bred, eager to learn about the local culture, accustomed to appreciate the simple things. What these people are looking for in a Bed and Breakfast is Homely atmosphere, home style meals, personalized service, health care attention, some room to talk with other guests, the friendliness of the hosts. Typically, these people also expect a help in in his tourist wishes. This type of tourist aim at visiting local attractions, knowing local culture, discovering the lifestyle, living the city with dynamic and fun style. How long stays. Levels and prices. Typically customers of B & B come in pairs. But often they also come alone or in small groups of three or more people. The stays more common in B & B are short, often 2-3 days, but this is not a rule: there are also several clients that, if they are very satisfacted, also stop in the structure for 15 days or a month. The prices are usually very affordable. But if the B & B is located in a historic, scenic or natural area, or if the position is very much requested, then the question of the price becomes relative. A B & B that has something very special can also be costly. Best Bed and Breakfast in the world, according to some specialized websites, are English ones. Great structures there are also in Australia, in the US, in Europe, in Thailand too. Many travelers argue that the best Bed and Breakfast are those Italians, but very often in Europe there are B & B of great level, especially in France, Germany, Spain. Relating B&B in the world, there are also selections e international rewards. Tripadvisor, for example, from 12 years report the BnB international levels, rewarding the best ones in the world. In the last ranking list, within the top 10 BB there are 6 structures of United Kingdom, two of the US, one of Thailand, one of Morocco.